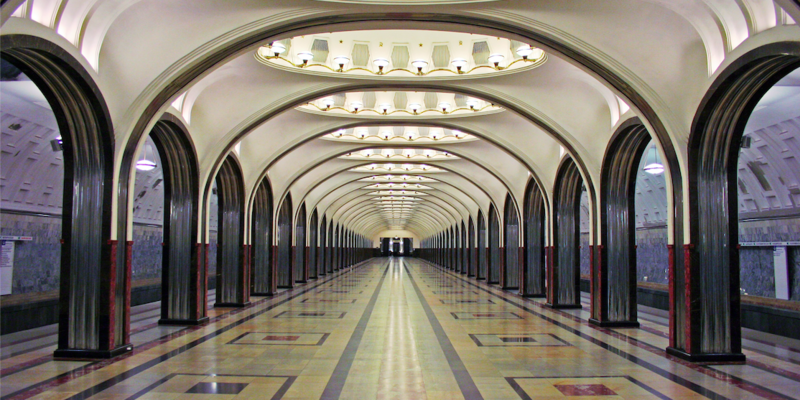 Moscow metro is well-known all over the world for its beauty and reliability. Today we will look at fun and unusual facts about this amazing means of public transport in Moscow. 1) You will notice that the stations are sometimes announced by male and sometimes by a female voice. When you are travelling towards the city center – it will be a mole announcer, toward the outskirts - female. Why? To make it easier for blind people to use the metro. The idea was suggested by the society of the blind in 1984 and came to life pretty fast after. How to remember which way is which? Local people joke that the female voice invites you home when you are travelling from work and the male voice is your boss hurrying you up to be at work in the city center. 2)As in London and many other cities, Moscow metro was used as a shelter during air raids in WWII. 3) Some of the stations of the Moscow metro are so deep that they have different levels of pressure at the entrance and down at the station. One of such examples is “Park Pobedy” station where the air pressure difference between the upper and the lower steps of the escalator is 6 mm Hg. 4) The handrails of the Moscow metro escalators move faster than the escalator stairs. 5) There is a city legend about dogs travelling deliberately to the different parts of the city using metro. This phenomenon even attracted the researches from the Moscow State University who found that one of the dogs got on the train in the city center and traveled to the meat market on the outskirts where it got off the train and headed to one of the sausage stalls. 6) You will not find any rubbish bins underground (which is a reason of complaints for many passengers). However, the explanation to it is simple safety concerns. Before 1970 you could easily find rubbish bins at the stations. 7) Moscow metro is one of the most reliable and efficient in the world. The interval between the trains during rush hour is only 90 seconds! More than that, throughout its long history it has been closed only once and only for a day on the 16th of October 1941. 8) When travelling to the Red Square and getting off at the Ploschad Revolutsii station, do not forget to rub the statues! Yes, it does sound weird, but the statues are said to bring good luck so rubbing the nose or a paw of the dog may help with passing your exams well, the sailor’s pistol for a successful business day, student’s shoe for a happy marriage or the sailor’s flags to make your dreams come true. Solutions for any worry! But do not rub the rooster’s beak – it is believed to bring bad luck! 9) Forgot your bag on the train? Look for it at the Kotelniki station. The lost and found office is located there and you are most likely to find your lost possessions at this station. 10) Funny enough, Moscow metro could have been launched much earlier than it actually did. However, the church was against people going underground as it would be inappropriate for humans made in the image of God.